Our students are coming back! This exclamation is equal parts exciting and stressful—exciting because it is a new year, stressful because there is lots to be done to prepare for the year. We have prepared for the new school year including trainings and, of course, retreats. The most recent retreat I worked and assisted in planning was our annual Student Activities Hub retreat for several of our student organizations and student workers. This was one of the first events I attended last year as a new hire, and this year I was in charge of planning it out from top to bottom. One of the main objectives I wanted to commit to during this retreat was to educate our students on the topic of collaboration. This is something I have talked about a ton and heard even more about in my first year. Who’d have thought collaborating would be so important in Student Affairs? Apparently it is not effective for departments to silo off from one another. But, for various reasons, we often fail to effectively practice and model collaboration for our students. Our egos get in the way or we get busy and just need to get an event planned, scheduled, and done. This is the same type of cycle our students get stuck in—we want to begin changing that. Our way of introducing collaboration at the retreat was through an activity in which students had to take three to four completely different groups and figure out an event, philanthropy, etc. that could appeal to each of the groups as well as to the university community. Students were given 30 minutes to develop a program and then were asked to act out their program for the group. While this activity was informative and got students thinking about collaboration, it was also hysterical. Our events theoretical events ranged from a dance off for charity to a political debate between candidates for city dog walker and a tournament involving whiffle balls full of shaving cream. While some events were slightly impractical, we got to talk about bringing together groups from various backgrounds and how much impact groups could have when pooling resources together. Ok, so this is a great story, but what does it have to do with #SAFirstYears? In our graduate classes we constantly talk about collaboration and having amazing programming that is both collaborative and informative for our students. We come up with great ideas in the classroom, but when we get into our professional careers we become hesitant to make those ideas reality. Why? Are we scared to partner with other areas and departments because we want the spotlight for our own area? 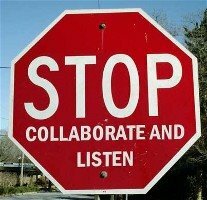 Or, are we hesitant to collaborate because we don’t have many resources and we don’t want to look like we are begging departments for money? I honestly don’t know… but, I do know that we aren’t setting a great example for our students. My personal opinion, be it my own and it is a humble one, is that we focus too much on collaborating to find money for something and not enough on actually collaborating to make a great event for the general student population. Yes, great events take money, but great events also take good staff, great organization and planning as well as publicity. You can find something for everyone to do that will allow them to contribute more than just money toward an event or program. How can you transfer what you have learned about collaboration in you educational experiences to your professional life?